New York (January 10, 2019)—Dr. Barbara Hempstead, a preeminent physician-scientist, educator and academic leader, has been appointed dean of the Weill Cornell Graduate School of Medical Sciences, effective Jan. 14. She succeeds Dr. Carl Nathan, who led the graduate school since 2017 and completed a planned two-year term. The Weill Cornell Graduate School of Medical Sciences offers professional scientific training for doctoral students, researchers in health policy and healthcare delivery, and aspiring physician assistants. With its partner the Sloan Kettering Institute, the graduate school boasts more than a dozen doctoral and graduate programs in a variety of disciplines including biology, pharmacology, biophysics, chemical biology, clinical epidemiology and health services research, and computational biology. In her new role as dean, Dr. Hempstead will build on the graduate school’s exemplary academic reputation by enhancing its curriculum and expanding the research opportunities it offers to students. This includes encouraging interdisciplinary collaborations between trainees and their counterparts at Cornell University’s Ithaca campus and Cornell Tech on Roosevelt Island. In addition, Dr. Hempstead will seek to more closely integrate the academic programs at Weill Cornell Medicine to enrich doctoral, medical and master’s students’ scientific and medical perspectives. This rigorous training will ensure that students are prepared to succeed in a rapidly evolving scientific environment. A distinguished hematologist, neuroscientist and administrator, Dr. Hempstead’s career at Weill Cornell Medicine has spanned more than 30 years, during which she has served as co-chief of the Division of Hematology and Medical Oncology in the Weill Department of Medicine and associate dean for faculty development. Most recently, Dr. Hempstead led the institution’s academic medicine program as senior associate dean for education. In that role, Dr. Hempstead oversaw implementation of Weill Cornell Medical College’s innovative curriculum, now in its fifth year, which integrates the scientific basis of disease with early exposure to clinical care and a formal curriculum on professionalism, and provides a dedicated six-month research block to complete the Areas of Concentration capstone program. A national search is underway for Dr. Hempstead’s successor for this role. As dean, Dr. Hempstead will advance Weill Cornell Graduate School of Medical Sciences’ commitment to recruiting and supporting a vibrant and inclusive scientific student community. As of fall 2018, more than 800 students are matriculated at the graduate school, nearly 500 of whom are pursuing doctorates and nearly 300 of whom are working toward master’s degrees. Importantly, the Weill Cornell Graduate School of Medical Sciences has been highly successful in recruiting and supporting graduate students from diverse backgrounds, bringing different perspectives and approaches to solve outstanding scientific questions, a commitment Dr. Hempstead embraces. A key component of that work involves enhancing interdisciplinary collaborations between Weill Cornell Medicine and its neighboring institutions. Cornell Tech offers an unparalleled opportunity for students to develop technology solutions that have human applicability, Dr. Hempstead said. She will also drive synergies between Weill Cornell Medicine’s doctoral, master’s and medical students to ensure that they are exposed to multiple scientific and medical disciplines. For doctoral students, collaborating with Weill Cornell Medical College students can contextualize the clinical implications of their fundamental research and inspire new lines of scientific inquiry, Dr. Hempstead said. That extends to students pursuing master’s degrees, such as aspiring physician assistants, for whom working in integrative teams will be the enduring paradigm. A board-certified hematologist, Dr. Hempstead investigates molecules called growth factors that regulate cellular behaviors, with a particular focus on factors known as neurotrophins. Scientists have long known that neurotrophins promote neuronal growth and survival, but can cause neuronal death or dysfunction following injury from conditions such as a stroke or seizure. Dr. Hempstead discovered that precursors to neurotrophins, called pro-neurotrophins—previously thought to be biologically inactive—are responsible for these deleterious effects. Using basic and translational approaches, Dr. Hempstead seeks to understand the conditions under which proneurotrophins act, and identify compounds that can inhibit their negative functions. These findings may have important implications for diseases that affect other biological systems, such as the vasculature. Dr. Hempstead has been continuously funded by the National Institutes of Health for more than three decades, and four patents have been filed for her work. She has published more than 130 scholarly papers in journals including Nature and its specialized publications, Science, Cell, and Neuron. Dr. Hempstead has been recognized nationally and internationally for her scientific contributions. She is an elected member of the American Society for Clinical Investigation—where she was also a national counselor—and the American Association of Physicians, and served on the Eunice Kennedy Shriver National Institute of Child Health and Human Development’s Board of Scientific Councilors. Dr. Hempstead is a past recipient of the Irma T. Hirschl/Monique Weill-Caulier Trust Award and Burroughs Wellcome Clinical Scientist Award in Translational Research. Dr. Hempstead received her bachelor's degree in biology in 1976 from Tufts University, and her medical degree and doctorate in cellular biology in 1982 from Washington University School of Medicine in St. Louis' Medical Scientist Training Program. She completed her residency in internal medicine, followed by a fellowship in hematology and medical oncology at NewYork-Presbyterian/Weill Cornell Medical Center. Dr. Hempstead joined Weill Cornell Medicine’s faculty in 1987, rising through the academic ranks to professor of medicine in 2001. She joined the Weill Cornell Graduate School of Medical Sciences’ faculty in 1994 and 1995 in the Neuroscience Program and the Physiology, Biophysics and Systems Biology program, respectively. 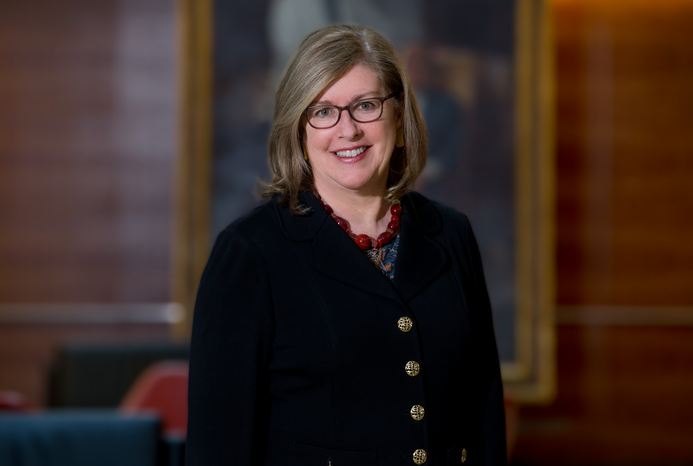 Dr. Hempstead served as co-chief of the Division of Hematology and Medical Oncology from 2004-2012, when she was appointed associate dean for faculty development and led the institution’s efforts to foster junior faculty members’ professional growth. She served in that role until 2016; in 2015 Dr. Hempstead was appointed senior associate dean for education. Weill Cornell Medicine is committed to excellence in patient care, scientific discovery and the education of future physicians in New York City and around the world. The doctors and scientists of Weill Cornell Medicine — faculty from Weill Cornell Medical College, Weill Cornell Graduate School of Medical Sciences, and Weill Cornell Physician Organization—are engaged in world-class clinical care and cutting-edge research that connect patients to the latest treatment innovations and prevention strategies. Located in the heart of the Upper East Side's scientific corridor, Weill Cornell Medicine's powerful network of collaborators extends to its parent university Cornell University; to Qatar, where Weill Cornell Medicine-Qatar offers a Cornell University medical degree; and to programs in Tanzania, Haiti, Brazil, Austria and Turkey. Weill Cornell Medicine faculty provide comprehensive patient care at NewYork-Presbyterian/Weill Cornell Medical Center, NewYork-Presbyterian Lower Manhattan Hospital, NewYork-Presbyterian Queens and NewYork-Presbyterian Brooklyn Methodist Hospital. Weill Cornell Medicine is also affiliated with Houston Methodist. For more information, visit weill.cornell.edu.